Kay’s lovely meditation album contains three guided meditations set to beautiful music by Ray Dickinson. The meditations contain messages that Kay, a trance medium, has channelled from a group energy who call themselves ‘The Circle of The Light of The Love Energy’. Their messages encourage us to understand our place in the universe and to love each other and ourselves. The meditations are available in MP3 download format from CD Baby, Amazon and Apple iTunes. A physical CD is available from Amazon. Kay Meade’s soothing, balm laden words make ready this ‘western yogi’ for her journey within. Each of the three guided meditations form a sturdy bridge from the hubbub and noise of my daily life to the quiet serenity of introspection. Kay Meade’s new guided meditation CD is now available. These three guided meditations are delightful visualisations that take you on spiritually enlightening journeys all set to beautifully composed music. Kay is a medium who channels in trance. Through the peace and tranquillity of meditation Kay enters the trance state and receives messages from her spirit guides. Her spirit guides are a group energy that introduced themselves in 2009 as The Circle of Light of The Love Energy. Kay has been inspired to present these three guided meditations to share wisdom received from her spirit guides. These guided meditations have been set to beautiful music sensitively composed and performed by Rachel Dickinson. Has you dancing amongst the stars embraced and guided by the spirit within to show you a spiritual truth. Takes you on a journey with angelic beings to receive an enlightening message about the preciousness of all life. Lets you enter an enchanting place to discover who you really are. Rachel was classically trained in music at Kings College London, and went on to complete a further postgraduate in sonic arts composition at NZ School of Music. Kay channelled these messages from The Circle of The Light of The Love Energy during meetings of our meditation group. In love we come as always, and we surround your group tonight, and we want you to feel the words we say. Not just with your ears. We come to tell you, you need to love yourselves. You cannot give love until you love yourself. You have this energy available to you now. It is all nurturing. It is what you need, but there is no point us just saying this. We need you to feel it. You need to love yourselves. Love yourselves, forgive yourselves. You are what you are and you are beautiful and whole and everything that you need to be. Loving yourself, we have spoken to you about. It is a very necessary part of development. The human being gathers around itself layers as it moves through its life journey. If the layers are such that they are protecting against the truth, they will not help. It is necessary to peel back the layers exposing the truth of who you are and the love that you are. Believe in yourselves. Be love. Kay channelled this message in October 2011. All on Earth now want Earth to take its place in the universe. It may not seem like that to you but all have a part to play, with each opposing action forming new definitive direction in the awakened. Angels walk the Earth now in human form for they have accepted the call to help Earth at this very special time in Earth’s development, reshaping, and its vibrational standing within the universe. There are also human beings that have progressed their vibrational level who are assisting Earth. There are many channels upon the Earth that are helping with the awakening of the most necessary currency for Earth – Love. There is rejoicing in the heavenly realms as the awakening times are happening and continuing allowing a time of greatness for Earth. Kay channelled this message in February 2012. You live dimensionally. This is for some a new concept. So to those we impart this information. Your energy is in your human form and we have said it is with us too. So if you can accept this, then stretch a little more. If you can accept that, then consider please that it is also possible, for your energy to be in other parts of the universe experiencing other existences too. These run parallel. A multiplicity of your energy exists. Remember your energy is divine, it is within you and without – so is in everything that is. In your quieter times you may have awareness of what exists without. This awareness will stretch you to explore further in your human existence, providing expansion that benefits the Whole. 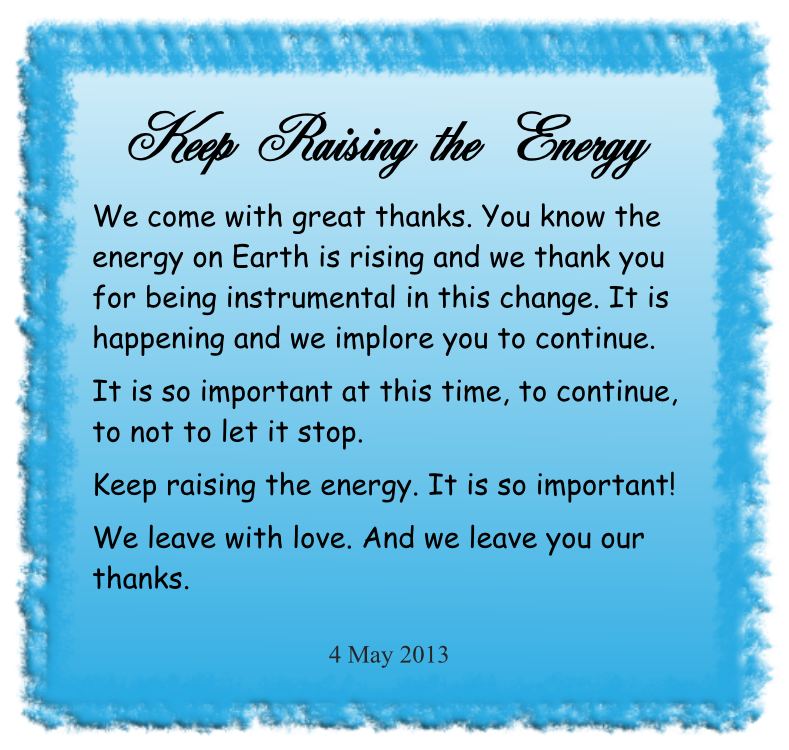 Kay channelled this message during a meeting of our meditation group (or circle) in February 2012. Kay said she was sure the message was from her quietly spoken female guide. I stand forward and bring through the energy of love. You know this energy. This is the energy from which you come. Your energy still dwells from where you came and we know it very well. Your energy within your human form is beautiful and rich and has everything that you need to help you on your way, to help you to Light the path for all that you come in contact with. The beam of Light that is with each of you is a collective Light and it joins you all together. It is the Light of Love. Let this be what you will be on Earth. Let the people you come in contact with know you as we do. You have the most beautiful energy, so please release it. Please show it and let that beam from Earth return to the heavens above where we dwell and where you have dwelt with us and you are still with us. Never forget it. Kay channelled this message during a meeting of our meditation group (or circle) in late February 2012. Kay channelled this message in October 2012. What power you connect to, when the mind is quiet, as peace then prevails there. The mind is not constantly struggling with what matters not, instead it allows the centre of your being to be present. The centre of your being is love pure, and this is the empowering source of your beingness. Being in harmony with this power is bringing about the greatest change in humanity allowing ascension of its kind, bringing safe passage to those that believe and keep faith with the great creator.